Rarely can history have dictated that the blood of three beheaded daughters should be injected into a vein of hope. The operation, I suppose, was self-administered by the stout little man with thick, matted hair sitting in front of me in an upper floor of the University of Toronto’s medical centre. I might even call Izzeldin Abuelaish stubborn, save for his awesome courage and his instant invitation for coffee and dates. He welcomes visitors to his fifth floor office with a large coloured photograph on the opposite wall which has the dignity and objectivity of an Impressionist painting. This took place at 4.45 pm on 16 January 2009. Bessan was 21, Mayar 15, Aya 13. 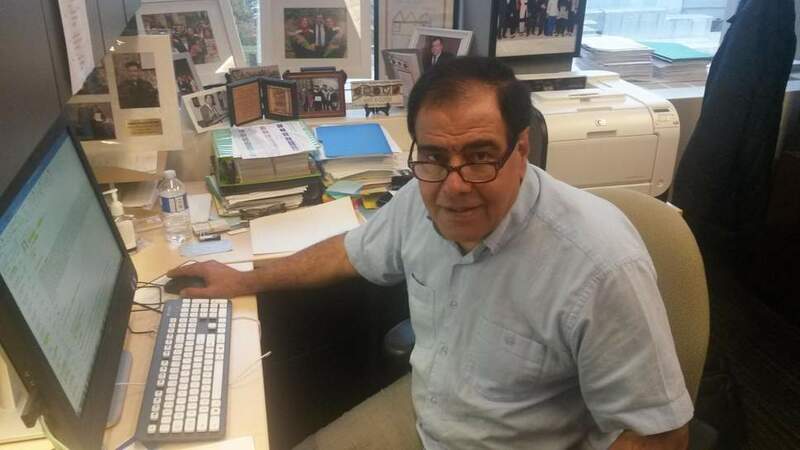 Izzeldin Abuelaish is an associate professor of global health, born in the Jabaliya refugee camp in Gaza, but the 63-year-old gynaecologist still mops his eyes when he comes to this point in our conversation almost 10 years later. I do not bring up the terrible ironies. I do not refer to his wife, who died of cancer only four months before the Israelis killed the three young women and Izzeldin’s niece. He was himself already the first Palestinian to receive a staff position at an Israeli hospital – could there have been a more appropriate symbol of human trust between two sides? And he speaks Hebrew, of course, and was speaking Hebrew on a live broadcast to Israeli television in the room where his daughters’ remains were lying in their blood in January 2009. It would be pleasant to record that this changed everything, that the Israelis realised finally, in one terrifying, humbling live broadcast that their army’s butchery of the civilians of Gaza – along with its pathetic Islamist militia – must now end. For what? Each time Gaza was eviscerated, the Israelis claimed self-defence after Hamas’ largely inaccurate and often home-made rockets were fired into the Israeli frontier town of Sderot. A few years ago, I went down to Sderot and discovered that it was once a Palestinian village called Huj whose Arab inhabitants – who helped their Jewish neighbours in the 1948 war – were ruthlessly driven out by the Israeli army of the time. Indeed, the Israelis even ignored the appeal of David Ben-Gurion to let the villagers stay. And one of Izzeldin’s surviving daughters read my old article and told her father – which is why he greeted me warmly in the early cold autumn of Toronto. Because his grandfather was the mayor of Huj in 1948 and because his family, unbeknown to me of course, came from the old village of Huj. And thus Izzeldin’s grandparents were forced from their village by the new Israeli state and abandoned to the camps of Gaza – from which the Hamas rockets now fall on what was Huj and what is now Sderot. I am therefore not surprised to find that Izzeldin has been to Huj/Sderot, found his destroyed village’s cemetery of stones and some of its fruit orchards and talked to the leaders of the local Jewish kibbutzim and even found, not far away, the gated enclosure which protects the grave of that most warlike of all Israeli leaders, Ariel Sharon, the man who sent his army’s militias into the Sabra and Chatila camps in Beirut in 1982 and which murdered there its Palestinians inhabitants, up to 1,700 of them. History hangs in curtains over the lands of the Palestinians – both Arab and Jew – who lived under the British mandate, and over the lands in which they live today. In many cases, the curtains are heavy with blood. The lands are usually the same. Which is where our story takes on a certain nobility. For despite the fact that he vainly took the Israelis to court for his family’s slaughter – first they claimed that there were snipers in the Abuelaish house, then that militants were hiding there, then that the shells which killed the daughters and niece came from Hamas (all disproved) – he founded the “Daughters for Life” Foundation to provide scholarships for young women to study at universities in the West Bank, Gaza, Israel, Lebanon, Jordan, Egypt and Syria. He wrote a book called I Shall Not Hate. Now a Canadian citizen, Abuelaish is much honoured, with human rights awards and a degree from Simon Fraser University. And he clings to what – I try to speak the truth here – is perhaps a very forlorn hope: that history will always surprise us. “Did you ever dream that a black guy would be president of the United States?” he asks. “If I’d told you that 15 years ago, you’d have told me I’m crazy. Or would you imagine Trump would be president? Can you tell me what will happen tomorrow? Did you think Arafat would ever shake hands with Rabin?” I’m not at all sure that I’d have brought Trump into these dreams, but I get Abuelaish’s point: that some things are unimaginable, others pre-determined. The latter is true. But Abuelaish’s determination is laced with an innocent pragmatism. He does believe that Palestinians and Israelis should love one another. But he places his trust in common sense, which is a dodgy foundation for peace in the Middle East. There can be no “transfer” of Palestinians from the West Bank, he says. It would be impossible. I am not so sure. He thinks Abu Mazen, the Palestinian “president” is “smart” but doesn’t agree with his “stewardship”, which – these are my words, not Izzeldin’s – is fossilised and corrupt. Izzeldin speaks of unity and then says – all too true – that as Palestine gets smaller and smaller for Palestinians, so the Palestinian factions (the Palestinian Authority, Fatah, Hamas, you name it) want to be bigger and bigger. He is a tough man. “I will never give up. I will never forget my daughters. I believe one day I will meet them and I am accountable to God and to them and they will ask me: ‘What did you do for us?’” Izzeldin talks of his wounded daughter Shatha, who was partially blinded by the tank shells and who later said to him: “If I don’t see with my right eye, I have my left eye.” Shatha came top of her class in her exams that summer of 2009 and passed with flying colours at the School of Engineering at the University of Toronto. “The antidote of hatred and revolution is success and education,” he says. A week earlier, he had expressed his condolences for the 11 Jewish Americans murdered in their synagogue in Pittsburgh. It’s a hard call. When he was travelling to Israel on the Canadian Governor General’s jet on a delegation to the Middle East, Abuelaish presented his Canadian passport to the Israelis at Ben Gurion airport. But along with another Palestinian-born delegate, he was made to wait – until he was given a “Palestinian permit”. I cringe as I hear of this unnecessary, shameful act, although I suppose – in an unintended way – it redeemed his Palestinian identity while demonstrating the impotence of his country of citizenship. He continues his legal case against the Israelis. Whatever compensation he wins – and he should win – will go towards Daughters for Life. He is writing a new book, which will be titled: “I Shall Not Fear”. But during our conversation, I notice that his mind turns to a disturbing question. How come Malala, the young woman gravely wounded by the Taliban, was so feted – and rightly so – in the West, while Shatha was largely disregarded? He doesn’t begrudge Malala her courage or her fame. But he notices a difference between the two young women and a very crucial one: the identity of those who almost killed them.